In Ephesians 6:10-17 we are instructed to put on the whole armour of God ,that we may be able to stand against the wiles of the devil.Did you know that Jesus also spoke the words of His Father many times in scripture to stop the power satan thought he had over our Lord? When Jesus was tempted He spoke words found from even long ago that was Gods protection from previous generations. He was tempted when He was hungry and responded with scripture. (Matthew 4:3-4), 3 And when the tempter came to him, he said, If thou be the Son of God, command that these stones be made bread.4 But he answered and said, It is written, Man shall not live by bread alone, but by every word that proceedeth out of the mouth of God. (Deuteronomy 8:2-3). 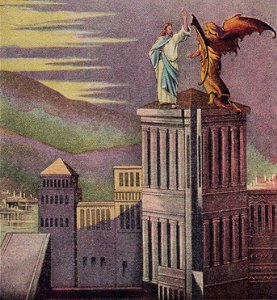 He was also tempted that He was not protected by God (Matthew 4:5-7), 5 Then the devil taketh him up into the holy city, and setteth him on a pinnacle of the temple,6 And saith unto him, If thou be the Son of God, cast thyself down: for it is written, He shall give his angels charge concerning thee: and in their hands they shall bear thee up, lest at any time thou dash thy foot against a stone.7 Jesus said unto him, It is written again, Thou shalt not tempt the Lord thy God. (Psalm 91:11-12). When we too are faced with being tempted,it is the sound word of God that will help us to bear whatever tries to take us from following the Lord as we should (1 Corinthians 10:12-13), 12 Wherefore let him that thinketh he standeth take heed lest he fall.13 There hath no temptation taken you but such as is common to man: but God is faithful, who will not suffer you to be tempted above that ye are able; but will with the temptation also make a way to escape, that ye may be able to bear it. (James 1:12-16). The Gospel of John is where Jesus Christ revealed the religious elect as children of the devil who is a murderer and the father of lies. For this purpose the Son of God was manifested; to destroy the works of the devil.